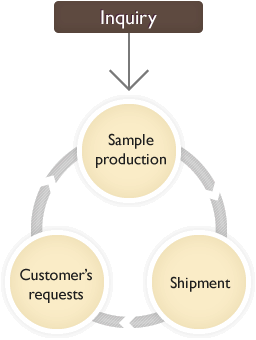 Below is an explanation of the business process, from the initial inquiry to the delivery of the goods. Not every step of this may apply to all cases, as we try to respond to the wishes of each individual customer. 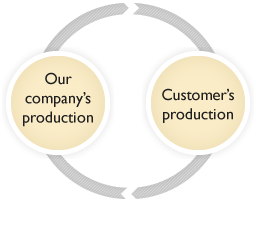 The one consistent factor is that we will continue making samples until our customers are satisfied. First, the customer explains what kind of materials they want, and what they are planning to make. We make several cut samples based on the image expressed in the initial hearing. We listen to further requests based on the samples, and continue manufacturing samples to better match the customer’s idea. Once we have created a satisfactory sample, the customer tells us what they’d like to officially order. We create a final sample for confirmation. If it is necessary, we will make a trial product using the manufacturing methods we used to make the final sample. If this does not match the customer’s image, we can recreate it as many times as necessary. 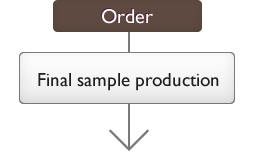 We produce the ordered amount. After a final quality check, we deliver the product.